Poornima Chikarmane is an Associate Professor at SNDT Women’s University in Pune and a co-founder of the waste pickers trade union Kagad Kach Patra Kashtakari Panchayat (KKPKP). She is also a consultant with the 3D Program, working to increase access by waste pickers to social welfare services or schemes and benefits, including health services. Trained as a biologist, Sayali recently switched careers to do what she thinks is more meaningful – serving as an advocate with the waste pickers trade union KKPKP. Sayali now helps waste pickers access government health schemes in Pune city in India. 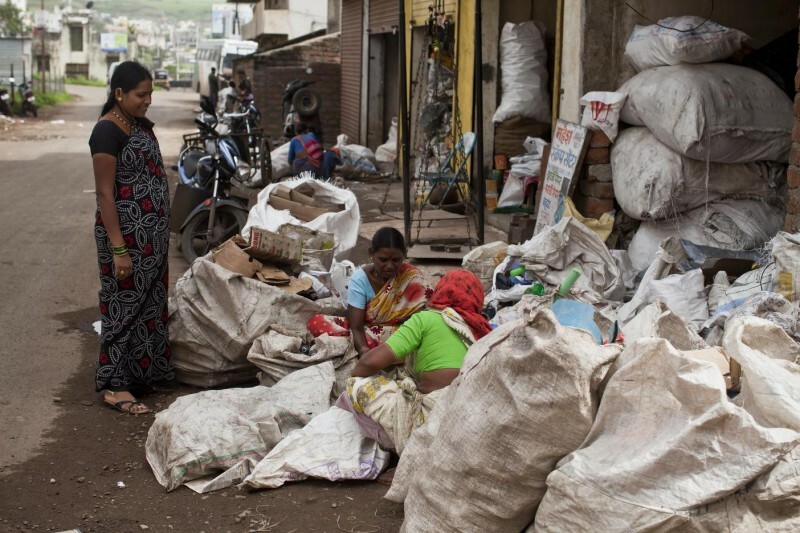 Over 75% of the waste pickers in the city of Pune are women. Their economic, social and environmental contributions to the city are impressive – they collect over 600 tons of waste each day, 90 tons of which is diverted from landfills and recycled, and up to 8 tons is composted daily. Despite this, waste pickers - who are poor Dalit women - and their families are often treated with contempt and are not afforded their rights and entitlements. Members of the waste pickers' trade union KKPKP at work. Photo by Amit Thavaraj, 2011. In conversation with Poornima, Sayali recounts her encounters with a large private multi-specialty teaching hospital that has over 800 beds. Operated by a public charitable trust, the private hospital is required to reserve 10 % of its beds for Indigent Patients and to treat them free of cost under the State Aided Charitable Trusts Hospital Scheme (SACTHS). It covers the cost through an Indigent Patients Fund (IPF) into which it deposits 2% of its turnover. Trust hospitals, such as this one receive tax, land and other concessions from the government. The hospital is also an official participant in the Urban Poor Health Scheme (SGVSY) for slum dwellers in which hospitalization costs are split equally between the patient and the Pune Municipal Corporation. The hospital also participates in the state-funded insurance based Mahatma Phule Peoples Health Scheme (MPJAY) that provides free treatment to poor patients who require expensive procedures and tertiary treatment. Sayali: Devaki, a waste picker, called to say her daughter-in-law Janaki had fallen off a bus, hit her head and vomited. She was in casualty (the emergency room) with a saline drip and little else. The hospital refused admission till she paid a deposit of 10000 rupees, which she didn’t have. What she did have was a ration card stamped Below Poverty Line that entitled her to medical care under three government schemes. She lay there till I reached the hospital. The billing administrator asked her to pay 4000 rupees for a CT scan and if she needed an operation, he would admit her under MPJAY. Her SGVAY card had expired. I insisted that she qualified for SACTHS. He claimed the hospital had exhausted its Indigent Patients Fund. I asked him to put that claim in writing. Meanwhile the doctor retorted that “She shouldn’t have come to this big hospital if she didn’t have the money!” He insisted it was not a trust hospital until I logged onto the internet on my phone and showed him the website, after which he thanked me for ‘updating his knowledge’. By then it was 8 pm, so I made several calls to officers at the Charity Commissioners office. One of them called the hospital and Janaki was finally admitted, given treatment and discharged after four days. 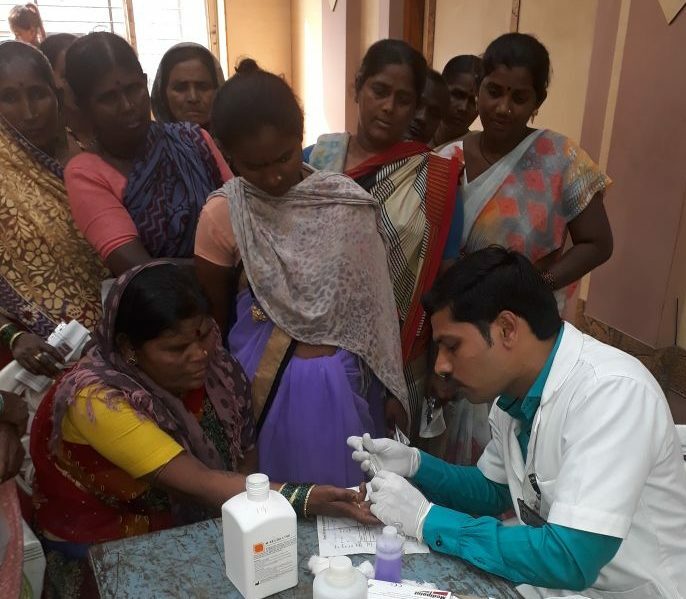 PCMC medical check-up event under MJPAY, 2018. Used with permission by Poornima Chikarmane. Poornima: Has the hospital been more cooperative since? Sayali: Oh no. Deepak, another waste picker died yesterday after he was refused services. Four nights ago he felt giddy and uneasy so his wife Kamini took him to this hospital because he had blood pressure problems. He had a stroke at the hospital, fell down and passed urine. He couldn’t pay the deposit of 30000 rupees. The hospital called the public 108 emergency medical services line and sent him to the government hospital. The entire process took a few hours. The critical ‘golden hour’ period during which treatment has to be given was lost. He was about 45 years old, and now Kamini is left alone to bring up their young children. Poornima: Is this particular hospital the problem Sayali? Sayali: Oh no. I have had the same experience with other charitable trust hospitals. They want only paying patients even though they are officially registered to provide services to low-income patients, as part of the government schemes. They do not take waste pickers or other poor patients seriously. Only poor patients with some reference or influence are treated, when either their employers, municipal councilors or local social workers intervene. A patient, who comes to the service with her documents and says ‘I am eligible for the scheme,’ just will not be entertained. The Charity Commissioner regulates implementation of the trust hospital scheme. That office needs to insist that trust hospitals must implement the scheme in all sincerity and be accountable for their actions. The free treatment that they are expected to provide to indigent patients is after all in exchange for the concessions that they get from the government. Sayali’s report of the experience of waste pickers is in sharp contrast to my own as a middle-class, professional woman. Two weeks ago, my family physician advised me to get an ECG. Off I went to the nearest trust hospital. The tests were done in the emergency room before I filled out a single form or paid a single penny, obviously because I fit the ‘paying’ patient stereotype. People like Deepak and Janaki are subject to the worst forms of discrimination. The decisions hospital staff make to admit patients, to insist on a deposit before treatment, and to provide treatment, are quite literally those that can make the difference between gifting life or condemning a patient to death. Empowered by the courts that directed the formulation of the scheme, it is the regulatory bodies of the state that must find a way to ensure that charitable hospitals fulfil their obligations. Otherwise the government and the hospitals are betraying a sacred trust!